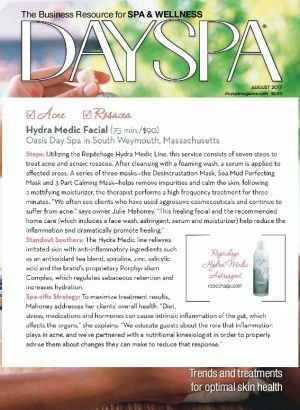 Home Page › Press › Oasis featured in Day Spa Magazine! Repechage Hydra Medic Facial! 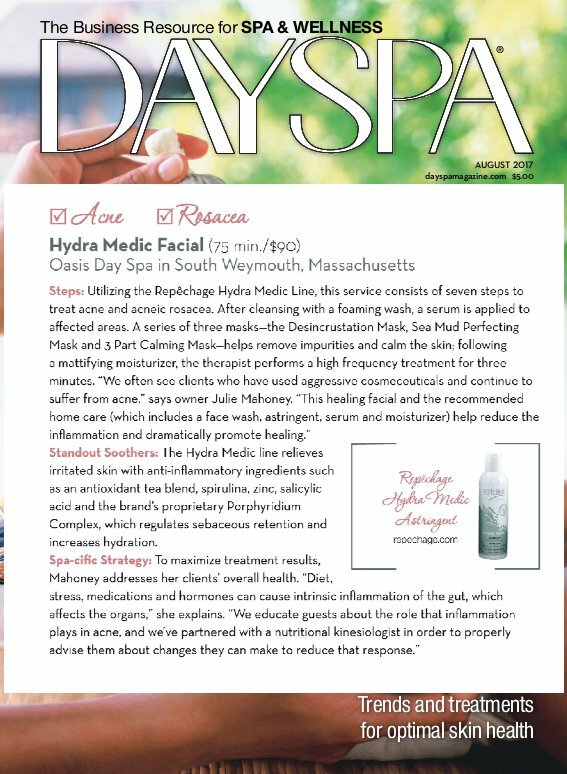 Oasis featured in Day Spa Magazine! Repechage Hydra Medic Facial! We have seen amazing results with Repechage Hydra Medic Facial! I have been an esthetician for 35 years and for the first ten years I personally suffered from acute acne. Our treatment options were very limited in the eighties and early nineties. Facials were very aggressive with extractions and products that dried and irritated the skin. There has been a significant shift in treating acne including acne rosacea over the past decade. We now know that intrinsic inflammation plays a key role in many skin disorders. Aside from the facial treatments in the esthetic room, it is important to address the client’s whole health as many factors such as diet, stress, medications and hormones can cause intrinsic inflammation of the gut which affects the organs. The skin being our largest and tangible organ often reflects when there is a systemic issue. We have partnered with a nutritional kinesiologist to give the client insight to make the changes they need to reduce the inflammatory response. The Repechage Hydra Medic line for acne and The Repechage Red-Out line for acne rosacea, reactive and inflammatory skin are phenomenal in reducing inflammation and promoting healing. Repechage Hydra Medic Line contains ant- inflammatory ingredients such as an antioxidant tea blend, spirulina and zinc combined with Porphyridium Complex, salicylic acid and zinc in perfect balance to regulate sebaceous retention and increase hydration. We often treat clients who have used aggressive cosmeceuticals and continue to suffer from acne. This 8-step healing facial and homecare deliver results for reducing the inflammation associated with acne and dramatically promote healing. We educate the client to know the role that inflammation plays in acne. Repechage Hydra 4Red-Out Line contains anti-oxidants and anti-inflammatories such as Quercetin and Rutin, to help calm combined with Micro Silver and which studies have shown to be important antibacterial ingredient for rosacea exacerbated by a sensitivity to microbes. The results are instantly visible and we recommend the Red-Out Cleanser and Serum as a necessity for home care maintenance of acne rosacea. The beauty of all the Repechage facials systems is they are uni-dosed in sealed foil packets. Step by step instructions with key benefits are printed on the facial kit making it convenient for the esthetician. Uni-dosing ensures treatment uniformity and delivers a professional presentation. I’ve been with Repechage for 30 years. It is simply the best holistic product I have found to treat a wide range of skin conditions.